Here are some pictures of a future boot user. 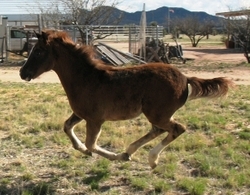 Her owner upgraded to Boa Boots for her other horses and just loves them!! Read about other happy boot users on our testimonials page. Here are a couple basic tips that apply to fitting the Old Mac's or a Boa Horse Boot. 1. If you have selected the proper size boot, the boot should pop on the foot when a little pressure is applied. It should not just slip on and be sloppy. 2. After the hoof is inserted in the boot pick up the horses hoof and apply some pressure to the boot and try and twist the boot. 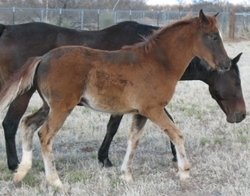 If the boot twists easily on the hoof it is too large. The boot should be snug and resist twisting. 3. Apply the same principles you use when selecting a hiking boot. You want a snug fit in both the width and length but also want a little wiggle room. If the hoof boot is too large in either the width or length, the boot will not work well for aggressive riding or rough conditions. 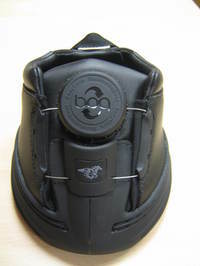 Boa Horse Boots use a cable and knob system to tighten the boot around the horses hoof. The Boa system is a wonderful system that is used in many different types of outdoor footwear. 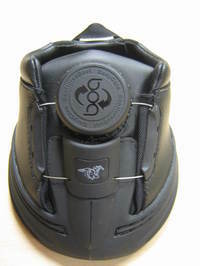 In addition to our Boa Horse Boot, you can find the Boa Closure System on snowboard boots, cycling shoes, running shoes, hockey skates, In-line skates and weight belts. We have found the Boa Closure System to work very well, but have seen a bit of trouble when the boot is used in extremely sandy or muddy conditions. In sandy and muddy conditions the cable sometimes binds in the lace guide area after being plugged with sand or grit. Here is how to free the cable. 1. 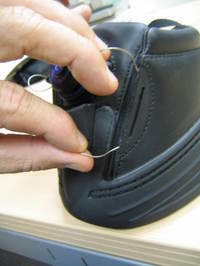 Grab both sides of the cable where is comes out of the lace guides. Pull the cable back and forth to remove the grit. Keep pulling the cable back and forth until the grit is removed. Do the same thing on the other side of the boot until the cable moves freely through both sides.